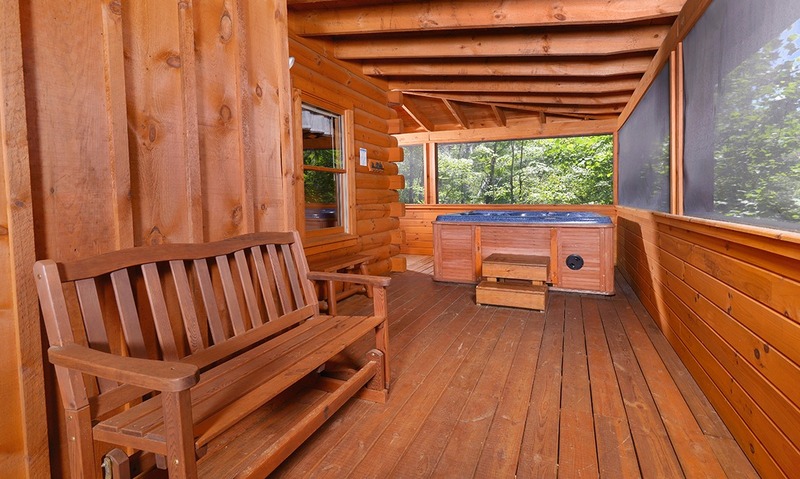 Surrounded by old-growth trees, Nature’s Splendor is a log cabin paradise in the Smoky Mountain hills. 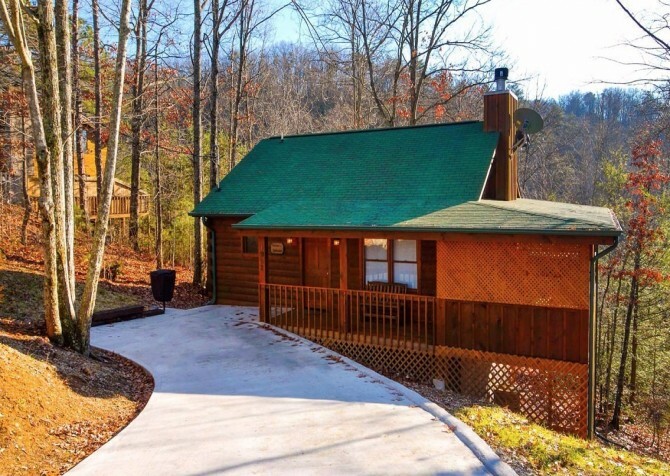 Book this 1-bedroom, 1-bath cabin for single family vacations or a romantic getaway for 2 to Gatlinburg. 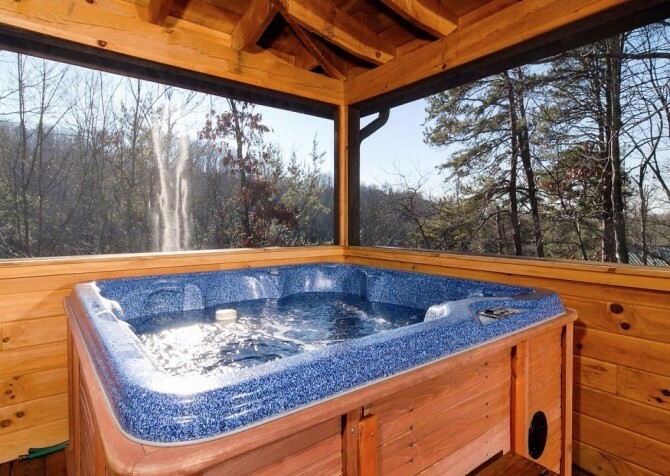 Even honeymooners will love Nature’s Splendor for its romantic amenities, including a gas fireplace, covered porch with a swing, and outdoor hot tub. 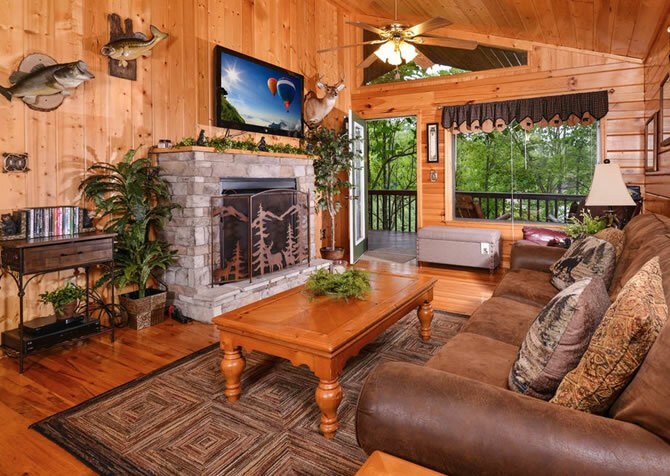 For entertainment, Nature’s Splendor offers a big screen TV and DVD player as well as convenient access to both downtown Gatlinburg and downtown Pigeon Forge. 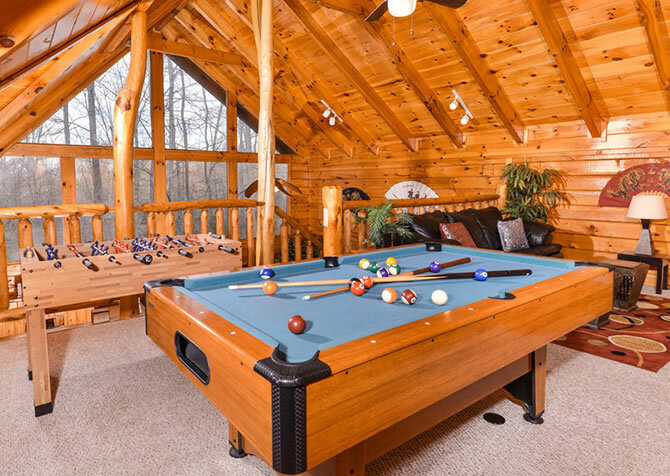 In fact, this cabin is situated nearly equally between both cities—with a short driving distance to each—so be sure to plan for date nights to downtown dinner shows or family outings to the many mini golf courses, go-kart tracks, and arcades on the strip. 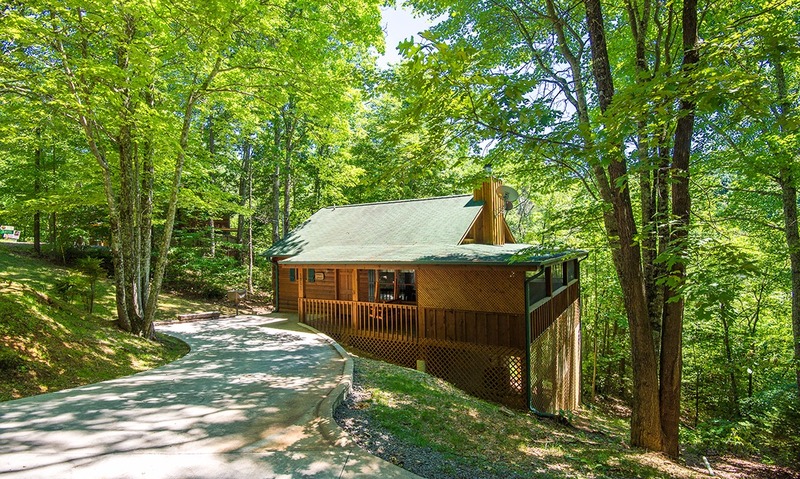 Along with its location, Nature’s Splendor offers other conveniences like a paved driveway and no steps into the cabin, making loading and unloading a breeze. 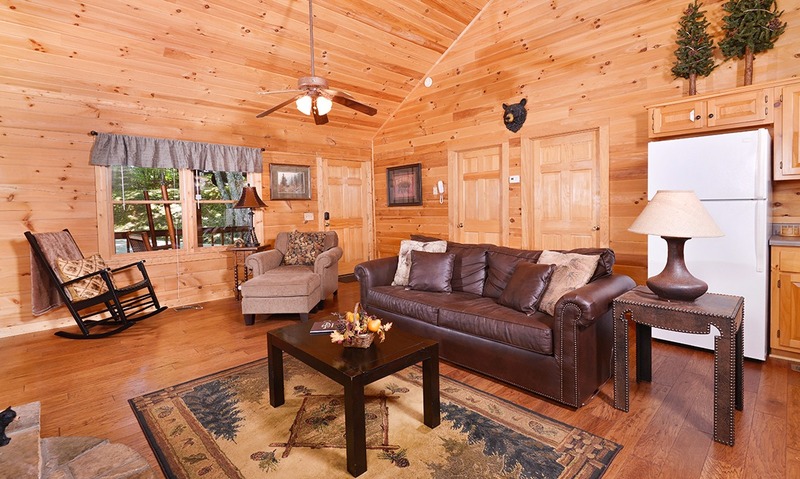 Enjoy an inviting interior, comfortable furnishings, modern mountain décor, and sleeping space for 4 inside Nature’s Splendor. The all-wood interior and vaulted ceilings of Nature’s Splendor create a warm and inviting space, beginning in this cabin’s living room. When you’re ready to relax after checking out the shops in The Village, sit back on the leather sofa or kick up your feet on the cozy chair with a matching ottoman. A rocking chair in the corner is perfect for rocking your little ones before nighttime or relaxing with a mug of hot cocoa on those cool mountain evenings. The Nature’s Splendor living room provides not only tons of comfortable seating, but also a room full of stylish mountain décor. 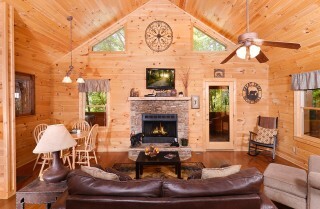 Notice the black bears on the hearth and the iron work art mounted on the walls. You’ll enjoy the chance to retreat in Smoky Mountain style without missing the modern conveniences of home—conveniences like a flatscreen TV above the stacked-stone gas fireplace complete with a DVD player. 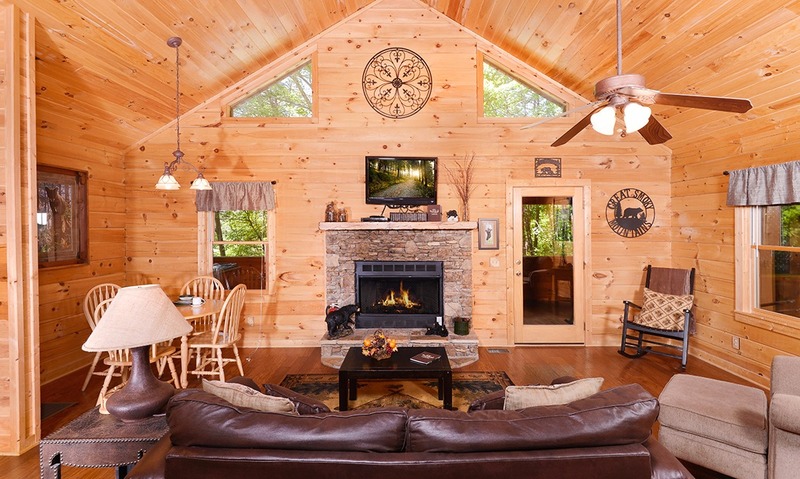 Make yourself at home in this cabin’s living room by planning a family movie night, using the coffee table for cards and games, or catching up on old magazines using the reading lamp beside the couch. 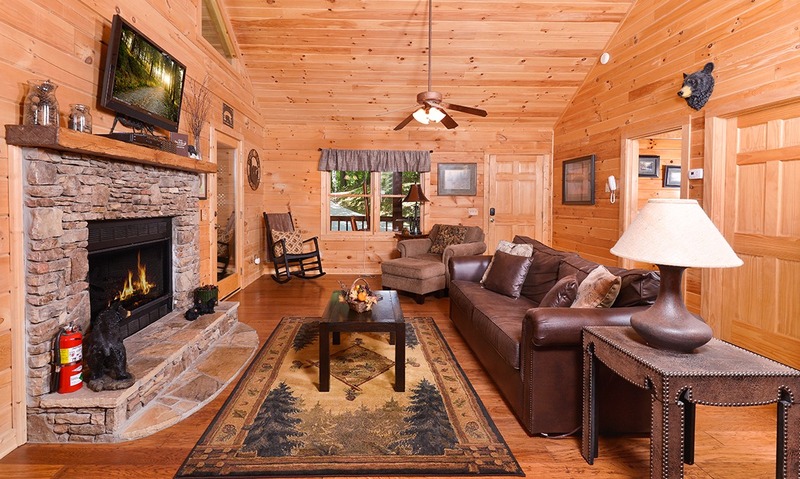 Wondering what sets our Gatlinburg cabins apart from your typical hotel room (besides their cozy living spaces, variety of amenities, beautiful views, and stylish décor)? 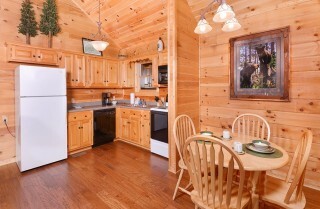 How about their fully equipped kitchens! At Nature’s Splendor, you’ll find an L-shaped kitchen that’s just the right size for a 2- to 4-person getaway. Enjoy all your major appliances—including a full-size refrigerator, electric stove, oven, over-the-range microwave, and dishwasher—as well as countertop essentials like a coffeemaker. On the mornings when you don’t visit one of Gatlinburg’s famous pancake houses like Pancake Pantry or Log Cabin Pancake House, make your own flapjack stack inside the cabin. And on the afternoons when you’re planning a picnic in the nearby Great Smoky Mountains National Park, you’ll find all the equipment you need to prep and package cold-cut sandwiches and locally grown fruit (available at the Gatlinburg Farmers Market) right inside this cabin’s kitchen. A pancake breakfast, an easy lunch of soup and sandwiches, a homemade dinner for 2—all of this is possible inside Nature’s Splendor with this cabin’s fully equipped kitchen and nearby dining room. The dining room consists of a wooden table for 4 with modern lighting overhead and a side window that overlooks the Smoky Mountain trees. You’ll have a hard time duplicating the comfort and privacy of this space with a visit to any downtown restaurant. So take advantage of all that Nature’s Splendor has to offer by planning homemade meal around the table—and take advantage of all that Cabins for YOU has to offer by adding our convenient vacation packages to any Smoky Mountain stay. These include a romantic candlelit dinner for 2 where we provide the steaks and sides so all you have to do is grill to perfection and enjoy! 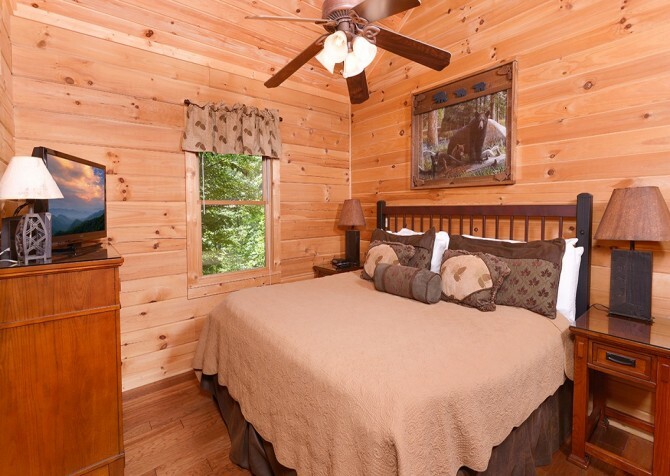 After long days of adventuring downtown, the bedroom inside Nature’s Splendor will be your favorite place to retreat for a good night’s rest in the Smokies. The wood walls and vaulted ceilings of the living room are duplicated in this space and the king-size bed features complementary earth-tones for a bedroom that’s as warm and inviting as it is comfortable. Enjoy a private TV and DVD player in this space as well as bedroom essentials like twin nightstands, reading lamps, a ceiling fan, and a window with beautiful wooded views. The second sleeping option inside Nature’s Splendor is a queen-size sleeper, which is perfect for kids or additional guests tagging along on your Smoky Mountain vacation. Enjoy a full-size bathroom attached to the bedroom, complete with a jetted tub. 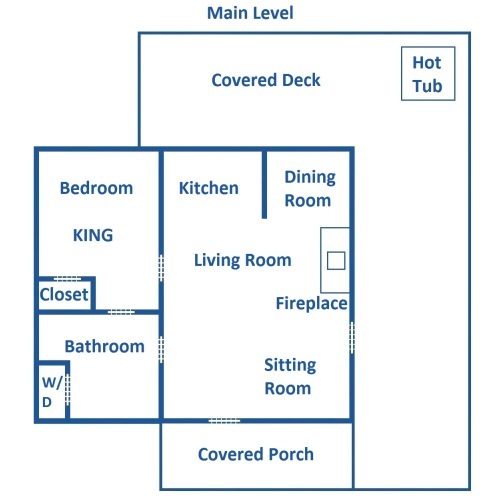 This bathroom can also be accessed from the main living area. At Nature’s Splendor, you’ll have plenty of options for enjoying the unique beauty of the Smokies. The covered porch with a wooden porch swing is the first space you’ll notice as you pull up to the cabin. But there’s so much more to love as you walk around back! Nature’s Splendor offers a large wraparound, screened-in porch with a 4-piece patio set, rocking chairs, and a stationary wooden bench. 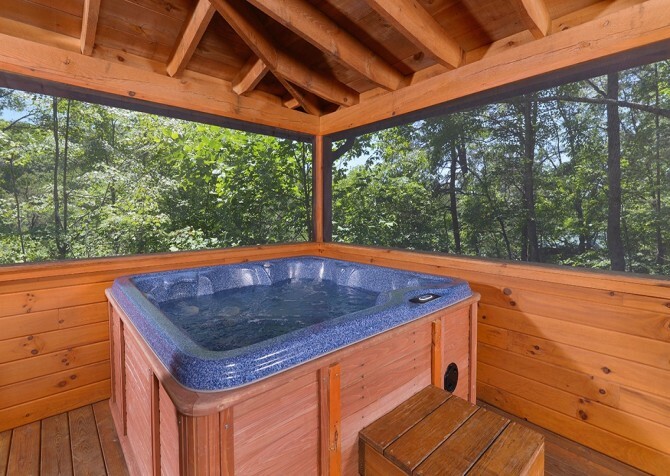 Besides all this, this cabin provides an outdoor hot tub inside the screened-in porch. That means you can enjoy a relaxing soak in any weather—rain or shine. 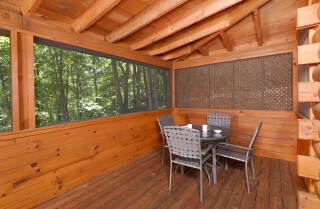 Nature’s Splendor provides tons of convenient amenities, including a fully equipped kitchen and huge screened-in porch. Other amenities you’ll appreciate about this cabin are its paved driveway, lack of steps into the cabin, and 1-story layout. Unloading the car will never be a chore at this Gatlinburg cabin! Another essential amenity that comes with Nature’s Splendor is access to high speed wireless. 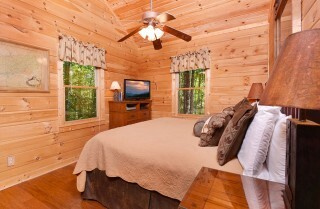 Bring along your laptops and tablets so you can stay on top of our Cabins for YOU blog during your Smoky Mountain stay. We’ll keep you up-to-date on local events, hot new attractions, and helpful tips so this year’s vacation to Gatlinburg can be the best yet! When you think the Smokies, you probably don’t think seafood, but that’s just because you haven’t been to Captain Jim’s! This all-you-can-eat hot and cold seafood buffet offers all your favorites from under the sea. With world-class roller coasters and impressive live shows, Dollywood is a must-see whether you’re visiting for your honeymoon or your family’s summer vacation. Plus, this popular attraction is less than 6 miles from Nature’s Splendor! Adjacent to the popular theme park Dollywood is its summertime sister, Dollywood’s Splash Country! If you’re looking for a fun way to cool down, don’t miss the slides and rides at this impressive water park inside Pigeon Forge. This property is NOT Pet Friendly. No Exceptions. 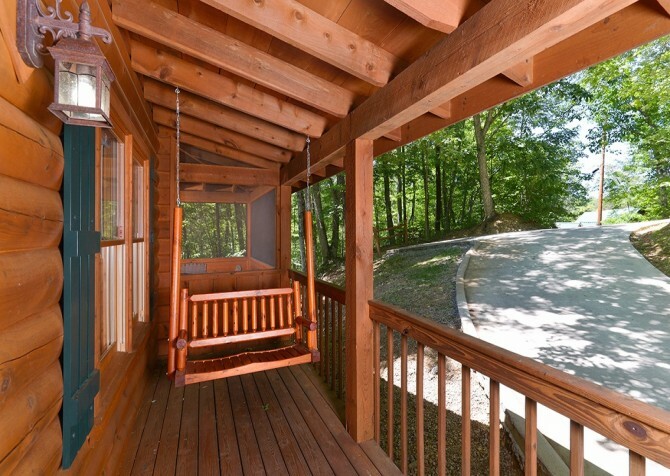 "This was the first time I ever rented a cabin in Gatlinburg and we loved it. Reserving the cabin was very simple and hassle free to do online. If you have any questions, the staff are very quick to response and help. The directions to the cabin were easy to follow. 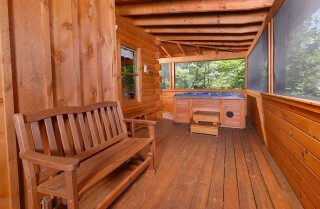 When we arrived at the cabin, we were both amazed at how clean the outside and inside of the cabin was. The kitchen, and bathroom were fully stocked with all the basic needs. Check in and check out was…"
"This was the first time I ever rented a cabin in Gatlinburg and we loved it. 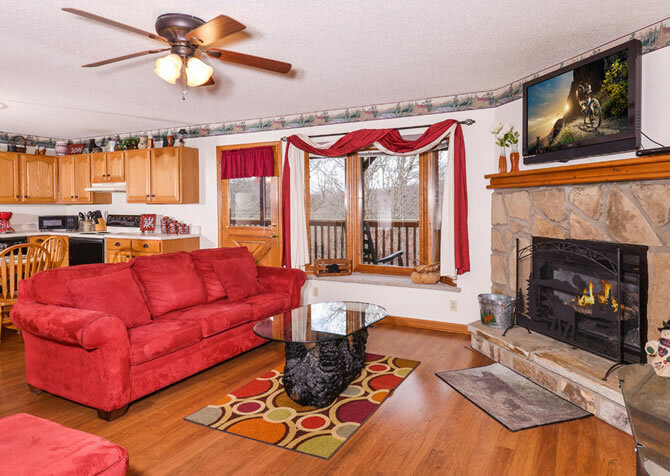 Reserving the cabin was very simple and hassle free to do online. If you have any questions, the staff are very quick to response and help. The directions to the cabin were easy to follow. 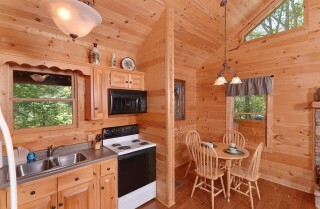 When we arrived at the cabin, we were both amazed at how clean the outside and inside of the cabin was. The kitchen, and bathroom were fully stocked with all the basic needs. Check in and check out was very trouble free using my phone and filling out a short form. We stayed in the Nature's Splendor and it was the right size and price for my boyfriend and I. We will definitely use this cabin for us again in the future, and I will recommend them to friends and family!" "Great cabins and are very clean. Called with a beeping noise issue in the morning on a weekend and got it fixed later that afternoon. Quick response times and friendly people. Loved Nature's Splendor!"